These Napa Wine Tour Packages Are Awesome, Check Them Out! Balloons Above the Valley (BATV) is an operator that provides hot air balloon rides to guests visiting the Napa Valley, California. We have the ultimate Napa wine tour packages that not only offer amazing sunrise hot air balloon rides, but also offer luxuries, comforts, and other amenities with unbeatable prices. From the start of its journey in 1976, Balloons Above the Valley is now flying high above its competitors. It has remained one of the best hot air balloon companies in Napa Valley. Our longevity in the business is factored by positive commendations (and recommendations) from travel critics and our dear patrons who are happy with our services. The view from the sky as you ride the hot air balloon is just beyond compare. You will marvel at the neat rows of grapevines that mark the plains and are set against the rolling hills and the deep valleys, all lush and green (or boasting colors of green and golden in the autumn) and greeting the rays of the sunrise. The tranquility and oneness with Mother Nature is something that cannot be described so easily — but you will be in a literally heightened bliss, that’s the least we could say! That’s appreciation of the Napa Valley’s beauty on a different level. 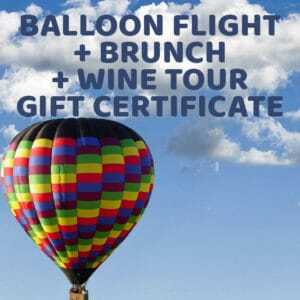 Sunrise Balloon Flight/Champagne Brunch/Wine Tour – A day (or two) will be filled with adventure and discovery as BATV offers this type of package for those who want to fly and explore wineries. Before your sunrise hot air balloon ride, we won’t let you go hungry so we serve you a hot, fresh and yummy breakfast with Starbucks coffee to get you alert and more excited. After that breathtaking flight, you will be treated to a fabulous brunch where you can share your amazing experience with the other guests while sipping on champagne (or more correctly, sparkling wine). Our transportation partner Napa Valley Wine Country Tours will then take you around the valley for the wonderful wine tour via their fleet of limos and limo buses. You may choose this activity right after the post-flight champagne brunch or elect to do this the following day. Napa Valley Wine Country Tours goes out of its way to choose wineries which they see as appealing to you and the other guests. Trained and knowledgeable chauffeurs will guide you all the way on your wine tours, share their valuable insights pertaining to your wineries, and are open to answer your every query. Don’t worry if you ask them basic questions — no question is too simple for them! You’ll be able to visit four to six different wineries. Discover the process of winemaking from grapes to glass, and also have the opportunity to taste premium wines from smaller boutique wineries. Enjoy buffet-style lunches at one of the lovely vineyards which only serves the freshest seasonal ingredients. BATV and the Napa Valley Wine Country Tours will re-work your schedule in case your hot air balloon ride is canceled due to weather conditions. 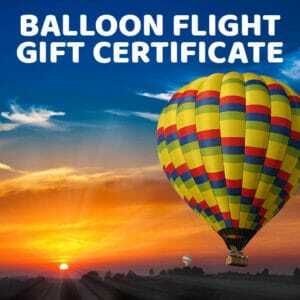 San Francisco Balloon & Wine Tour Package – Taking a vacation in San Francisco? You may also include wine tours in your agenda especially if you also plan to visit the Wine Country, which is just a 90-minute drive from the city. BATV and Napa Valley Country Wine Tours are also happy to provide you safe and convenient trips from San Francisco to the Napa Valley and back. Napa Valley Country Wine Tours pick you from one of three pickup locations in SF (4th at Mission, Union Square, and Pier 39) and drive you to the Wine Country. Not only you do ride on their luxurious limo buses, you also get to enjoy an on-board breakfast with mimosa. When you get to the vista point overlooking the world-famous Golden Gate Bridge, you don’t want to miss the opportunity to have a stop there for a photo-op! As you drive through the vineyards, our knowledgeable chauffeur will guide you through interesting points of interest and answer your questions. The diverse wineries will represent a wonderful sample of the delicate and divine tastes of both Napa and Sonoma counties. Apart from wine tasting, an olive oil tasting is also in order. Take a break from visiting the wineries during our delicious and fresh picnic-style lunch at one of the wineries. Day Two of this package consists of the yummy pre-flight breakfast with Starbucks Coffee, an amazing sunrise hot air balloon flight, and a sumptuous post-flight brunch. Following the brunch, you may elect to go back to San Francisco via a ferry ride. The Napa Valley Country Wine Tours will transport you right away to the Ferry Terminal in Vallejo. Or if you have the shopping and sightseeing bug, the Napa Valley Country Tours will pick you up and drop you off at one of the two shopping spots of your choice. Shop at the famous Oxbow Public Market (famous for its unique and artisanal delicacies) and the Napa Valley Premium Outlets before you going back to San Francisco via a ferry ride. BATV offers more than just hot air balloon rides over the heavenly Napa Valley landscape, which is already a big treat in itself. Add in the wine tours which will enrich your knowledge about wines and winemaking, and the luxury at competitive prices — what could be better than these Napa Wine Tour Packages from Balloons Above the Valley?